Kentucky Geological Survey, University of Kentucky. Kentucky has many limestone quarries. One of the largest is located in western Kentucky. Many of these are limestone mines, which are operated underground. A large limestone mine is located under parts of Lexington. Geology of Kentucky, presented by the Kentucky Geological Survey. Economic Geology of the Kenova Quadrangle: Kentucky, Ohio, and West Virginia, Bulletin 349 (excerpts), by Phalen, William Clifton, Department of the Interior, United States Geological Survey, Government Printing Office, Washington, D. C., 1908. Eastern Kentucky - This site includes a section on Eastern Kentucky geology and is a part of the Kentucky Coal Heritage page. Geology of Fayette County, presented by the Kentucky Geological Survey, by Brandon Taylor, Shea Burns, and Stephen Greb. The Geology of Kentucky - A Text to Accompany the Geologic Map of Kentucky, edited By Robert C. McDowell. Contributions to the Geology of Kentucky, U.S. Geological Survey Professional Paper 1151-H.
Kentucky Atlas & Gazetteer, presented by the Kentucky Geological Survey. Kentucky Rocks and Minerals, presented by the Kentucky Geological Survey, University of Kentucky. Place Name Search, presented by the United States Geological Survey. Kentucky Department for Libraries and Archives. This state agency manages library, archival, and public records programs. Kentucky Public Library Directory, presented by the Kentucky Department for Libraries and Archives. Murray State University, Pogue Library - Special Collections and Archives. You can read all about the Pogue Library Special Collections on Wikpedia. "Special Collections, located in Pogue Library, contains materials relating to the history and culture of Western Kentucky and neighboring states and the states from which most of the early settlers of this area came: Tennessee, North Carolina, South Carolina, Virginia, Maryland, and Pennsylvania. Among the library's collections are those relating to the Tennessee Valley Authority (TVA), the Civil War, and local history." Allen County, Kentucky - Historical Society, Scottsville, Kentucky. American Memory - the Library of Congress' gateway to primary source materials relating to the history and culture of the United States. Appalachian Center, University of Kentucky. Bell County Historical Society and Museum, 215 N. 20th St. Carnegie Library building, Middlesboro, Kentucky. For U.S. mail contact, send to: P.O. Box 1344, Middlesboro, Kentucky 40965; (606) 242-0005. Big South Fork Scenic Railway, Blue Heron, Kentucky; (800) 462-5664. Click here for further information on the Big South Fork Scenic Railway on the National Park Service web site. Bluegrass Scenic Railroad, Versailles, Kentucky; (800) 755-2476. Bowling Green, Warren County, Kentucky - History of Bowling Green and Warren County. The Bowling Green, Warren County, Kentucky Bicentennial Celebration Web Site. Brush Arbor Appalachian Homestead and Village. The Brush Arbor Renfro Valley Appalachian Homestead and Village site links to history, culture, music, events, and area attractions. Dry Stone Conservancy: Preserving and Promoting Dry Wall Masonry, Lexington, Kentucky. Ghost Towns of Kentucky, presented by Gary B Speck Publications. Ghost Towns of Kentucky, presented by Ghosttowns.com. Google Book Search: You can use Google Book Search to search for specific subjects in thousands of books available through the Google Book Search - both books under copyright and in the public domain. Hundreds of books are added regularly, so check back if you do not find books on the subject for which you are seeking information. The Great Rail Trail, presented by the West Kentucky Corporation. Hardin Southern Railroad's Nostalgia Train, Hardin, Kentucky; (502) 437-4555. Harrodsburg Historical Society, Harrodsburg, Kentucky. Highlands Museum and Discovery Center, Ashland, Kentucky. Historic Houses Foundation in the Louisville metropolitan area. Index of Resources for Historians - the Index is maintained jointly by the Department of History of the University of Kansas and the Lehrstuhl für Ältere deutsche Literaturwissenschaft der Universität Regensburg, and is managed by Eric Marzo of Regensburg and Lynn H. Nelson of Kansas. Kentucky and Tennessee Railroad Attractions, presented by TrailsRUs. Kentucky Buildings, Structures, & Architects on the Philadelphia Architects & Buildings Project (PAB) web site. You can search the database for buildings, structures, and architects either as a visitor or you can register free. You cannot search for specific cities, but you can search for county locations. There are no photographs presented, but the location and/or address and the name of the architect are included if known; and the historic registration information is also included. Kentucky Cemetery Records Database, presented by the Kentucky Historical Society. Kentucky Central Railway, Paris, Kentucky; (606) 293-0807. Kentucky Coal Mining Museum, Benham, Kentucky. Kentucky Facts and History, presented by the Kentucky State Library. The Kentucky History and Genealogy Project - American Local History Network - Kentucky, presented by Debi Kendrick, County Coordinator. Kentucky History Center, presented by the Kentucky Historical Society. Kentucky Museum and Library, presented by the Western Kentucky University. Kentucky Resources - Burgoo.com Area genealogy information and links to other sites. Kentucky Tourism, presented by the Kentucky Department of Tourism. Kentucky's 40 Most Popular Surnames, from the Kentucky resident birth certificate file, 2000 from the Kentucky Department of Libraries and Archives web site. Landmark Association, Bowling Green, Kentucky. Lexington, Kentucky: The Athens of the West - Architecture, presented by the National Park Service. "The earliest building designers of Kentucky were not professionally trained architects but were amateur builder-architects or builder-designers. Most of the builders were house joiners, carpenters, and bricklayers who conveyed the traditions of their immediate environment. By the late 1700s, Matthew Kennedy came to Kentucky from Virginia and Mathias Shryock came from Maryland, bringing with them traditional building skills from their home regions. "In addition to their traditional building methods, these builder-designers relied on regional materials. Stone was the predominant building material because of the availability of limestone and marble, a metamorphosed limestone. Stone was used in the foundations of early log cabins and for simple and complex building forms because it was durable, flexible, and could be used for architectural ornamentation. Kentucky clay provided a good quality of brick that could be fired into a hard brick. John Bob's was a local brickyard in Lexington in 1791." Madison County Historical Society, Inc., P. O. Box 5066, Richmond, Kentucky 40476-5066; (606) 622-2820; (606) 622-1792; (606) 986-9341 x5260. Guide to The Madison County Historical Society Records 1729-1993, compiled by Kevin Keefe and Crystal Ramsey, Eastern Kentucky University, 1996. Old Louisville Guide - Old Louisville National Historic Preservation District. This web site presents many photographs, postcards, books, and historical resources about Louisville. Origins of Kentucky's County Names, presented by the Kentucky State Library. Railway Exposition Museum, Covington, Kentucky; (606) 655-5200. Rock Fences of the Bluegrass Still in Jeopardy (photograph and history), by Leatha Kendrick, on the University of Kentucky web site maintained by Alicia Gregory. Resources for Historians, Hanover College, Department of History, Hanover, Indiana. Signs of History for Kentucky, Pennsylvania and Virginia, presented by Grover and Jayne Hibberd. (The following quotation is used with permission.) "Travel the Internet and learn about Kentucky's, Pennsylvania's and Virginia's past through Signs of History ®.This project lists historical markers by counties and independent cities. The project also posts pictures of the markers as they are provided by participating schools, historical groups, and individuals." "Paper examining prevalence of stone structures and living stonemasons in area surrounding Franklin County, Ky. Includes biographical information and qualifications of stonemasons, 1986 survey of stone structures, photos and related 1959 article." Guide to the Linda Allen Anderson Collection, Nov. 22, 1959, Dec. 1985-April 1986, University of Kentucky Libraries, Special Collections and Archives. Extent: 1 folder. 82 items. 12 color photos. 68 b/w photos. Repository: Western Kentucky University Folklife Archives, Bowling Green, Kentucky, 42101-3576. (Some of the relevant subjects are: Stone masonry in Anderson County; the Bluegrass Region, Ky.; Fayette County; Franklin County; Jefferson County; Mercer County; Scott County; and Woodford County; and the Quarries and quarrying in the Bluegrass Region; Stone Buildings in the Bluegrass Region.) The web site provides the links to use to view the copyright notice and information on contacting the specific repository holdings in this archival collection. Tour Historic Bowling Green on the Burgoo.com web site. We Collect Kentucky, Western Kentucky University. Below are just a couple of the online collections. Woodford County Historical Society, Versailles, Kentucky. World of Our Own: Kentucky Folkways, produced by KET, Kentucky Educational Television. (The quotation below is used with permission.) If you are interested in obtaining this video or others from Kentucky Education Television, you can call the KET Tape Duplication Service at (859) 258-7217 (800-945-9167 in Kentucky) or e-mail tapes@ket.org for information. "From stonemason Robert C. Jackson Sr., we learn that 'green rock,' rock fresh from the ground, is easier to work because it's still full of moisture." Filson Library, Filson Historical Society. Kentuckiana Digital Library, Kentucky Digital Library. The Kentucky Transportation Center Library, a departmental library in the College of Engineering. Margaret I. King Library - Special Collections and Archives, University of Kentucky, University of Kentucky. Allen County Historical Museum/Allen County Historical Society, 301 North Fourth Street, Scottsville, Kentucky. American Cave Museum and Hidden River Cave. The museum is in downtown Horse Cave. It features a two-story replica of a cave chamber complete with stalactites and stalagmites, conservation of caves and water, and historical exhibits. Anderson County History Museum, 108 E Woodford Street, Lawrenceburg, KY 40342-1110; phone: (502) 859-1815. Behringer-Crawford Museum, P. O. Box 67, Devou Park, Covington, KY 41012; (859) 491-4003. The natural, cultural, and artistic heritage of northern Kentucky in relation to the Ohio Valley Region is presented in this museum. Ben E. Clement Mineral Museum, 205 N. Walker Street, Marion, Kentucky. More than 30,000 native mineral specimens are displayed in addition to "other items of historical and geological significance from Mr. Clement's personal files and his mining operations." Blue Grass Railroad Museum, located 15 miles from Lexington, Kentucky. Blue Ridge Heritage Museum, Winchester, Kentucky. "The Blue Ridge Heritage Museum seeks to bring the history of Central Kentucky to life by collecting, preserving and exhibiting objects valuable to the history of Winchester, Clark County and the region." Bobby Davis Museum & Park (AKA Hazard Perry County Museum), 234 Walnut St., Hazard, KY; (606) 439-4325. The Bobby Davis Memorial Library building is constructed of Perry County Sandstone. Breckinridge County Historical Society and Museum, P.O. Box 498, Hardinsburg, Kentucky 40143-0498. Caldwell County Railroad Museum, Princeton, Kentucky. The Clement Mineral Museum, Marion, Kentucky. Cloverport Museum, 205 Main Street, Cloverport, Kentucky. The museum is located in a restored freight depot. (Open April-October) Information from Breckinridge Attractions. Coal House Museum, Bell County Chamber of Commerce building, North 20th Street, Middlesboro, KY 40965; (606) 248-1075. Cumberland County Historical Museum, Burkesville City Park, Burkesville, Kentucky. Elkhorn City Railroad Museum, 100 Pine Street, Elkhorn City, Kentucky; (606) 432-1391. Filson Museum, presented by the Filson Historical Society. Georgetown/Scott County Museum, 229 East Main Street, Georgetown, Kentucky; (502) 863-6201. Hancock County Museum, Old Train Station, Hawesville, Kentucky; (270) 295-3243. Exhibits of riverboats and family life at the turn of the century. Hart County Historical Museum, Main Street, Munfordville, Kentucky. The museum "houses thousands of artifacts related to Hart County and South Central KY history." Hopewell Museum, 800 Pleasant Street, Paris, Kentucky. The museum is located in the 1909 beaux arts post office building. The Hopewell Museum is the museum of Bourbon County history and Kentucky fine arts. Hopkins County Historical Society and Museum, 107 Union Street, Madisonville, Kentucky; (270) 821-3986. Kentucky Caverns (formerly Mammoth Onyx Cave). You can view beautiful onyx formations found in the underground chambers of Kentucky Caverns. Kentucky Military History Museum, East Main Street, Frankfort KY 40601; (502) 564-1792. The Kentucky Museum and Library. This site is presented by the Western Kentucky University, University Libraries and Museum, Department of Library Special Collections. Kentucky Museums That Display Rocks and Minerals, presented by the Kentucky Geological Survey. Kentucky Railway Museum, New Haven, Kentucky. Knox Historical Museum, Municipal Building, Daniel Boone Drive, Barbourville, Kentucky; (606)546-4300. L & N Railroad Museum, 101 N. Depot Street, Corbin, Kentucky; 800-528-6538. Mammoth Cave Wax Museum, 901 Mammoth Cave Road, Cave City, KY 42127, (270) 773-3010. Museum Center (formerly Mason County Museum), 215 Sutton Street, Maysville, KY 41056-1109; (606) 564-5865. McCreary County Museum, Stearns, Kentucky. For further information, contact: McCreary County Tourism Commission, P. O. Box 72, Whitley City, KY 42653; (606) 376-3008. Northeastern Kentucky Museum, 1385 Carter Caves Road, P. O. Box 461, Olive Hill, Kentucky 41164; (606) 286-6012. Ohio County Historical Society Museum, Main Street, Hartford, Kentucky; (270) 298-3177. Oldham County History Center / Oldham County Historical Society, 106 N. 2nd Avenue, La Grange, Kentucky. Owensboro Museum of Science and History, 220 Davis Street, Owensboro KY 42303; 270-687-2732. This museum has displays about astronomy, geology, botany, archaeology, anthropology and Daviess County history. Pennyroyal Museum, 217 E. 9th Street, Hopkinsville KY 42240; (270) 887-4270. Paducah Railroad Museum, 3rd 7 Washington Street, Paducah, Kentucky; (270) 442-4032 or (270) 443-7084. Portland Museum, 2308 Portland Avenue, Louisville, Kentucky; (502) 776-7678. This museum covers the days when Louisville and Portland were rival river ports. Railway Museum of Greater Cincinnati, 315 W. Southern Avenue, P. O. Box 15065, Covington, Kentucky; (859) 491-7245. Red River Historical Museum, 4541 Main Street, P.O. Box 195, Clay City, KY 40312; (606) 663-4000. The museum includes artifacts from the area's iron, logging and railroad industries, and more. River Heritage Museum, 117 S. Water Street, Paducah, Kentucky; (270) 575-9958. The museum exhibits the integral role of the rivers in the Four Rivers Region. You can read a detailed description of the museum in the article, "Museum to tell Rivers' stories," written by Herb Sparrow, in the "All Around Kentucky," July 2001 online edition. Scott County Museum, Georgetown, Kentucky. South Central Kentucky Cultural Center, Glasgow, Kentucky; 270-651-9792. Historic exhibits from a 5-county area. Tennessee Valley Railroad, presented by the West Kentucky Corporation. Western Kentucky University and Libraries, Bowling Green, Kentucky. Western Kentucky University Geology Department Hallway, Bowling Green, KY 42101; (502) 745-0111. There are Minerals and Fossils in hall cabinets. Wolfe County Historical Museum, Main Street, Campton, Kentucky. Woodford County Historical Society and Museum, 121 Rose Hill, Versailles, Kentucky. Wrather West Kentucky Museum, Murray State University, Murray, Kentucky. "The primary mission of the Wrather West Kentucky Museum is to highlight and promote an understanding of the social, cultural and economic development of West Kentucky and the Jackson Purchase." Bowling Green, Kentucky - Photo Album. This web site is presented by the City of Bowling Green. Kentucky Almanac, presented by Netstate.com. Kentucky Atlas and Gazetteer, Kentucky Geological Survey, University of Kentucky. Kentucky County Seats and Chambers of Commerce, presented by the Kentucky State Library. Kentucky Vital Statistics, Department for Libraries and Archives. Louisville Science Center, Louisville, Kentucky. TerraServer-USA, sponsored by the U.S. Geological Survey and MSN Virtual Earth. Austing G. Bartlett, Russellville, Kentucky, stone quarry operator - Russellville Stone Quarry. The Barlett Family Papers (1858-1930) are a part of The Filson Historical Society collection. These are the personal and business papers of Irving C. Bartlett, of Louisville, Kentucky, (a wholesale distillery distributor), and his son, Austing G. Bartlett, a stone quarry operator. 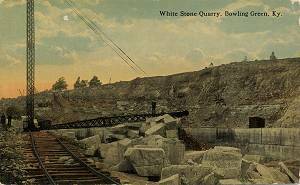 One of the subjects of the papers is the Russellville, Kentucky, stone quarry. (Source: Knt001341) This resource is listed in the Kentuckiana Digital Library. "Excerpt from Ann Woodlief's Craig Family genealogy. "(Lewis Craig) settled at Craig's Station on Gilberts Creek in Garrard Co., moved to Fayette Co. and the South Elkhorn church under 1792, then lived in Minerva in Mason Co. until his death, pastoring and building a substantial church. He established a number of churches and worked also as a stonemason or architect. He built the first church, the first school house, and the first courthouse (in Washington) Kentucky." "Eight years ago Karl Raitz' work on rock fences in Kentucky was instrumental in debunking the myth that these fences were built by slaves before the Civil War. The myth of the fences' construction, like many myths, was partly true. His investigation traced the real origins of the fences to the work of Irish stonemasons who immigrated into the Bluegrass in the early to mid-19th century. These masons passed the craft along to slaves who became master artisans themselves and further passed the craft on to other black artisans, giving rise to the popular labeling of the rock fences as 'slave walls.'" Irish Stone Masons in the Bluegrass Area - "Stone Masons and Their Craft in the Bluegrass Area of Kentucky." "Paper examining prevalence of stone structures and living stonemasons in area surrounding Franklin County, Ky. Includes biographical information and qualifications of stonemasons, 1986 survey of stone structures, photos and related 1959 article." Guide to the Linda Allen Anderson Collection, Nov. 22, 1959, Dec. 1985-April 1986, University of Kentucky Libraries, Special Collections and Archives. Extent: 1 folder. 82 items. 12 color photos. 68 b/w photos. Repository: Western Kentucky University Folklife Archives, Bowling Green, Kentucky, 42101-3576. (Some of the relevant subjects are: Stone masonry in Anderson County; the Bluegrass Region, Ky.; Fayette County; Franklin County; Jefferson County; Mercer County; Scott County; and Woodford County; and the Quarries and quarrying in the Bluegrass Region; Stone Buildings in the Bluegrass Region.) Click this link to view the copyright notice and information on contacting the specific repository holding this archival item or collection. Joel Tanner Hart (1836-1877) "Kentucky stone cutter who became a sculptor and poet. His most famous sculptures are of Andrew Jackson and Henry Clay. He spent the last thirty years of his life in Florence, Italy. The collection includes letters to and from Hart. The Earliest, written while he was a stonecutter...." Repository: The Filson Historical Society. Guide to the Joel Tanner Hart Papers, 1836-1877. Click here to view the copyright notice and information on contacting the specific repository holding this archival item or collection. This resource is listed in the Kentuckiana Digital Library. The following information is presented by Bob Francis on his Root and Branch web site. (Scroll down to BB-152 - Mt. Lebanon, Gov. James Garrard House; 1785 Peacock Road) (Although the main web site address is still active, the URL from which the below information was obtained is no longer at this link. )If you’d like to get in touch with Bob Francis, you can contact him through his web site, Bourbon County, Kentucky: History and Genealogy of the Region. One of 35 stone dwellings that are document in Bourbon County is located on a rise overlooking Stoner Creek. The building was constructed "...by renown stonemason John Metcalfe, the two-story, central passage ashlar house with one-story ell exhibits excellent workmanship." in 1785. One of the stonemasons who helped build the Old State Capitol was Thomas Metcalfe. On August 26, 1828, he was inaugurated as governor, and in 1860 Metcalfe County was named in his honor. The Church was constructed by stonemason and Kentucky governor Thomas Metcalfe in 1810. "The hewn stone section of the house is the original home of Ohio's second governor. It was erected in 1805. The stonemason was Thomas Metcalf, later a governor of Kentucky. It is located on State Route 136 and Township Road 21. The two-story addition, now the front of the home, was built in 1852 by George Kirker, son of the governor. George Kirker later served as a Captain in the Civil War. It is privately owned." "Site of stone tavern/inn built by stonemason Thomas Metcalfe, later governor of Ky. Owned by Henry Watkins and wife Elizabeth, widow of Rev. John Clay and mother of Henry Clay. Lafayette, traveling from Frankfort to Lexington, was entertained here on May 15, 1825; greeted friends and veterans and had to address crowd from upper balcony. Tavern burned in 1886." West Union United Presbyterian Church, 104 South Second Street, West Union, Ohio. "The West Union United Presbyterian Church was built of hewn stone in 1810. The stonemason was Thomas Metcalf who later became Governor of Kentucky. Governor Thomas Kirker was instrumental in getting the church built. This is the oldest church structure in Ohio still in use as a church."